The Como-Harriet Line. It’s now just a tiny museum line in southwest Minneapolis, but it once served downtown Minneapolis, the university, and the capitol. Much of its path was down city streets, where the signs of streetcars are long-gone. Through Como Park in St Paul and Linden Hills in Minneapolis, however, the line had its own right-of-way, off city streets. If you look carefully, you can still find signs of this. 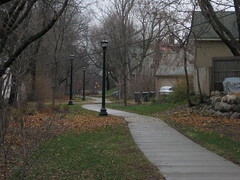 The Como-Harriet museum line ends at Linden Hills Blvd, near Lake Harriet. From there, the only evidence of a streetcar line is a gently curving path of oddly placed alleyways and greenspace. I followed this pathway to France Ave and the streetcar suburb of Morningside, which merged with Edina in 1966.